The holidays are upon us. For some, this means travel away from homes for an extended period. For most of us, this means the delivery of packages and the potential for theft. In this sponsored post from Reliant, we discuss a security system that offers peace of mind for homeowners whether you’re traveling, at work, running holiday errands, or otherwise on the go. With Security by Reliant, customers can get around-the-clock security that can be controlled from anywhere so your family and home are always protected. (One need not be a Reliant electricity customer to sign up for security services with the company, the program is open to everyone). Reliant offers a variety of packages and services to fit your unique security needs—Essential, Advanced or Premium plans—each of which offer 24/7 monitoring, access via an app, professional installation and more. 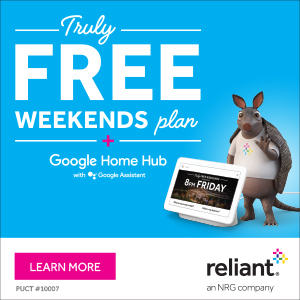 When you sign up for the Reliant Speak & Save 12 plan, you’ll get a Google Home Mini and Nest Thermostat E on Reliant. Additionally, with this plan, you’ll also enjoy 12 months of price security on your electricity. Temperatures are cooler and drier this morning, and this has largely ended the chance of fog like that which the Houston area experienced Wednesday. We now will see some very pleasant weather before rain chances return on Sunday. Thanks to a dry, northerly flow the region will have three dry and sunny days, with moderate high temperatures in the mid- to upper-70s. Low temperatures will range from the upper 40s north of Houston to the upper 50s to 60 degrees right on the coast. Overall, the weather should be just about perfect for the fall in Houston. The one concern we’ve been discussing is the lack of rain since Hurricane Harvey. I know, it seems daft to worry about drier weather after a storm like that. 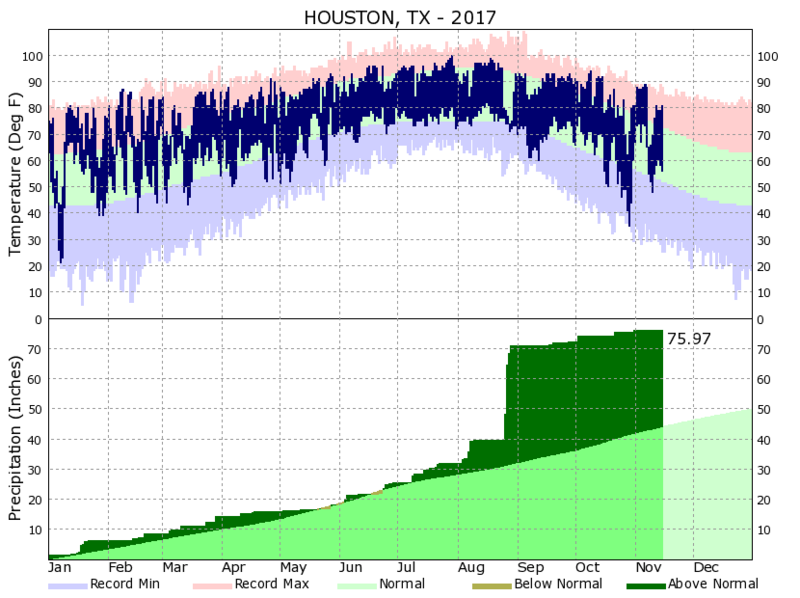 But the fact is, most of Houston has had just 4 to 6 inches of rain in the 14 weeks since the storm, and this is causing the region to slip into drier than normal conditions. We’re not in a drought yet, and there are no major widespread, or significant concerns. However by the end of a La Niña winter (typically drier than normal for Texas), we might be. A dense fog advisory is in effect for Houston this morning, and will persist through 9am or 10am. Visibility will be as low as one-quarter mile for some areas, and less than a mile across much of Houston. Please take care during your morning commute today, and expect delays in marine operations. After the fog burns away this morning, temperatures will be warmer today for most of Houston, as the next cold front pushing toward the region is doing so only slowly. That should allow high temperatures today to reach about 80 degrees under partly sunny skies later today. The front should finally move into Houston and through the region this afternoon, and reach the coast by around the evening. Rain chances with the front are near zero. We’re going to see a run of three days of absolutely gorgeous weather, with high temperatures in the 70s and lows generally in the low- to mid-50s, and dry air. Skies should be mostly sunny. Our only concern is that, at this point, we could really use a bit of rain as the region has dried out quite a bit since Harvey. (More on that Thursday). 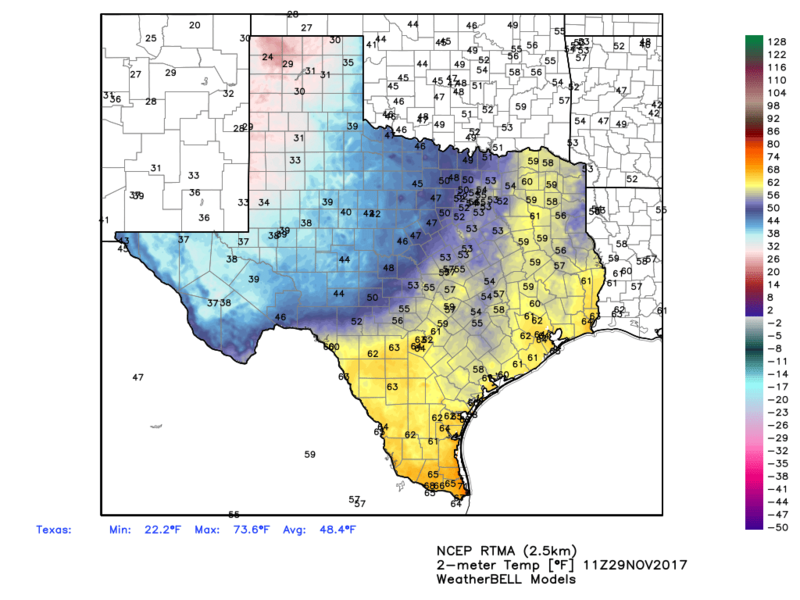 Winter is coming to Houston. No really, it is. 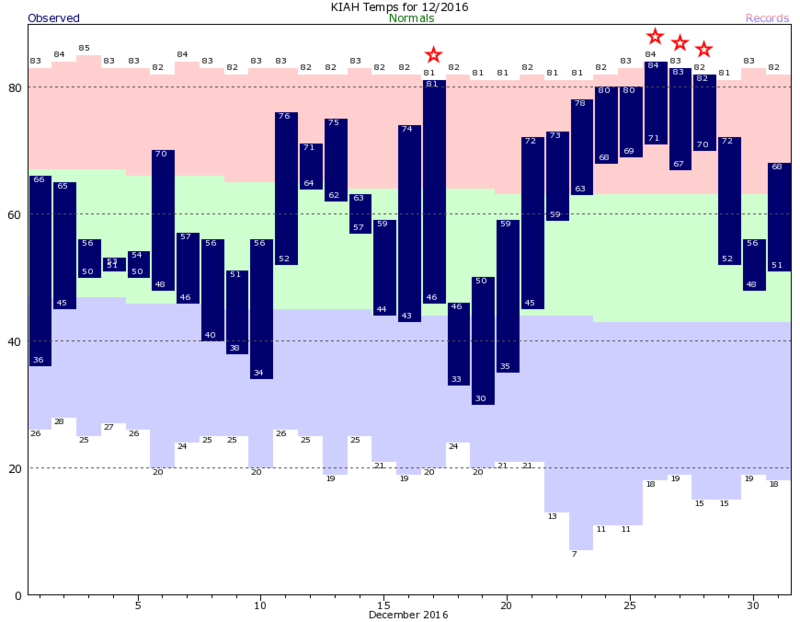 Temperatures this November have averaged about 5 degrees above normal, too, a lot like last year. But I’m willing to bet that December won’t see a repeat. Indeed, as I’ll discuss below, there are good reasons to think that a good chunk of December will see cooler than normal temperatures. Temperatures will warm into the upper 70s today, and humidity levels will rise a bit. However, a weak cool front will arrive on Wednesday morning to put a lid of temperatures for the rest of the week. This front could spur a few showers near or along the coast, but for the most part we won’t see any precipitation. Highs Wednesday should be in the mid-70s with continued sunshine.